Figure 1. 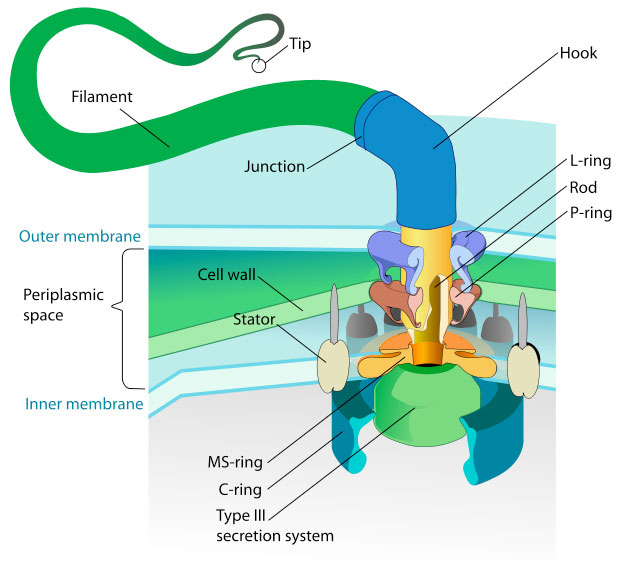 The bacterial flagellum (with rotary motor) has many features which people recognize as design features, such as a clutch. That is, the fast and furious motions of the bacteria might disrupt the formation of biofilms, so the bacteria need some means of stopping it quickly. The researchers discovered that a protein called EpsE was responsible somehow. But how did it work? There were two possibilities: One possibility is a brake, locking up the motor so preventing it spinning; another is simply to disconnect the motor from the filament, just as a clutch in a car disconnects the drive wheels from the engine. To decide between these options, the researchers attached the filaments to a glass slide, and observed the bacterium. 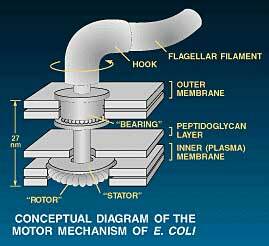 The flagellar motor was powerful enough to turn the entire germ once every five seconds, without EpsE. If EpsE were a brake, then the bacterium would also be unable to turn, like the wheels on a braked car; if it were a clutch, then the bacteria would be free to rotate if powered by another source, like the wheels of a car coasting down a hill on ‘neutral’, powered by gravity. It turned out that the bacteria with the protein present could indeed rotate passively, powered by the random collisions of molecules (Brownian motion6). In other words the filament freewheels. While human engineers solved the problem: ‘How do you temporarily stop a motor once it gets going?’ The Designer of the bacterial flagellum had anticipated that solution with a clutch. 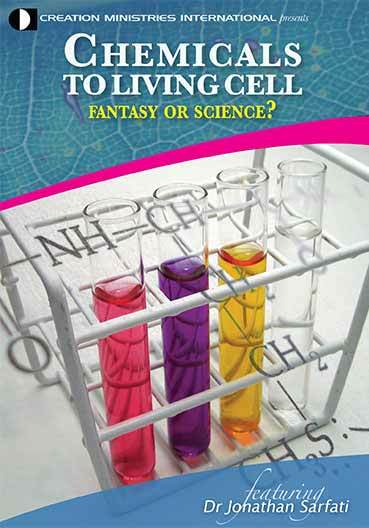 A good summary is by Howard Berg, a professor of molecular and cellular biology, and of physics, at Harvard University: Motile Behavior of Bacteria, Physics Today, 1999. Return to text. Microscopic clutch puts flagellum in neutral, Physorg.com, 19 June 2008. Return to text. Blair, K.M., Turner, L., Winkelman, J.T., Berg, H.C. and Kearns, D.B., A molecular clutch disables flagella in the Bacillus subtilis biofilm, Science 320(5883):1636–1638, 20 June 2008 | DOI: 10.1126/science.1157877. Return to text. Berry, R.M. and Armitage, J.P., How Bacteria Change Gear: Bacterial motility is arrested when a protein that acts as a clutch disables rotation of the flagellar motor, Science 320(5883):1599–1600, 20 June 2008 (perspective on Ref. 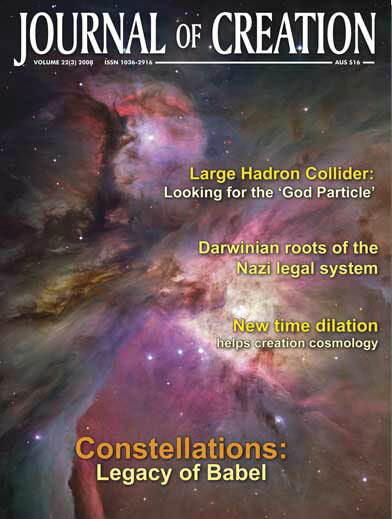 3)| DOI: 10.1126/science.1160444. Return to text. Biofilms have also helped understand one likely function of the appendix. See Bollinger, R.R., Barbas, A.S., Bush, E.L., Lin, S.S. and Parker, W., Biofilms in the large bowel suggest an apparent function of the human vermiform appendix, J. Theor. Biol. 249(4):826–831, 2007; Wieland, C. And Doyle, S. More musings on our useless appendix, May 2008. Return to text. One of the discoveries that first put Albert Einstein on the map was the cause of Brownian motion, and proving the reality of atoms (Einstein, A., Über die von der molekularkinetischen Theorie der Wärme gefordete Bewegung von in ruhenden Flüssigkeiten suspendierten Teilchen (On the movement of small particles suspended in a stationary liquid demanded by the molecular-kinetic theory of heat), Annalen der Physik 322(8):549–560, May 2005. The microscopic motion had been discovered by the botanist Robert Brown in 1827. Return to text.